United Gothian Knights of the world, congregated into the original first Templar Order, as established by the Prince of Gothia in 1099. The first two Templar Grandmasters were of the house of Anjou which we have demonstrated were Gothian Nobility. Prince of Gothia was a title which Raymond IV, the most senior leader of the First Crusade had held prominently. In this article we will get into the historical records which specify more on the founding of the Templar a whole generation before the popular version of the first two Grandmasters Hugh de Payens and Robert de Craon. "Marqis of Gothia" (translated princeps Gothiæ). This is about his role in founding the Templar Order while fighting for the Byzantine Emperor. The evidence is quite conclusive on the early founding of the order being at least the fruit of, if not the direct advice of this Gothian Prince. Gothia being the main hereditary title of his family. He was accredited in the earlier writings as founding the original Order of Knights Templar. Most French Knights were long known to be the subjects of Gothian Nobility, whether by the main Septimanian/Toulouse Branch or the many other Noble families who married into this Gothian/Visigothic House. Even the Frankish King Pepin had a claim to the Gothian title. This Germanic tribal foundation was well understood then, though little understood now. The main realms of France were all led by equal Princes as "peers of France". Therefore all the Knights who joined the original Templar are pretty well guaranteed to have had Gothian allegiances. Historians and experts agree to use the term prince for all such ranking "peers of France" as there was no differentiation of rank. The Knights Templar did not grant Knighthoods, you had to already be a Knight to join the order. In very rare cases some one was elevated to become a Knight within the order, though this was still achieved only via a fons honorum of a ruling Monarch granting the Knightood. 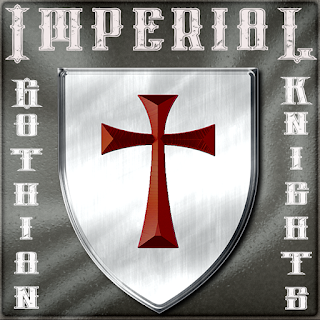 The Knights of the first generations who joined the Templar were under absolute authority of Gothian Monarchs. According to the below record, we also find that the Templar order was founded no later than 1099 by multiple Gothian princes. This was more than 30 years before the pope endorsed the Templar order of Knights. This was a full generation before the First "so-called" Grandmaster Hugh de Paynes had even reached puberty. Therefore he could not have been the first Grandmaster as we all have been told. Although he too was a Knight that was under Gothian Nobility. The Gothian Prince Raymond was then the oldest fighting Monarch in the Holy Land. He had fought the Muslims for much of his life, kicking them out of Europe. He was the main Royal who was accredited with the capture of Jerusalem in the First Crusade. He was a Peer of France (an equal rank of highest King), and was the Count of Toulouse among many other high Noble titles. Upon conquering Jerusalem, he was offered to be crowned "King of Jerusalem", however he wanted to remain fighting and so nominated his peer, Godfrey de Boullion, to be the first Crusader King. As we read in this authentic historical record of Simon de St. Bertin. This text was written, Circa 1135-7. The following is part of the entry for the year 1099, after the capture of Jerusalem and the crowning of Godfrey de Bouillon as King of Jerusalem. "While he [Godfrey] was reigning magnificently, some had decided not to return to the shadows of the world after suffering such dangers for God's sake. On the advice of the princes of God's army they vowed themselves to God's Temple under this rule: they would renounce the world, give up personal goods, free themselves to pursue purity, and lead a communal life wearing a poor habit, only using arms to defend the land against the attacks of the insurgent pagans when necessity demanded." There are many other authentic writings from early in the 12th Century but none allude to the actual founding of the order. Raymond was the only one of the leading Crusaders who refused to do homage to the emperor Alexius for their expected conquests. Therefore it seems more fitting one of the other Nobles would have finally accepted the crown which would only have been legally placed by the Emperor Alexius Commenus, the one whom they were fighting for. In the time when Godfrey was "reigning magnificently" would have been when he was busy liberating the Orthodox areas, in a great assistance to the Byzantine Empire against the Muslims. This would have been between 1096 and no later than the time of his death in 1100. As he only was King of Jerusalem for less than one year before his death. While Raymond IV, prince of Gothia lived another six years. As we read it was these Gothian Knights, "After suffering such dangers for God's sake" it is really pointing to the much longer campaigns carried out by the elder Gothian Prince Raymond who had fought the Muslims in longer campaigns. This all dates to near the time of the original capture of Jerusalem, making it 1099 the latest date for the founding of the original Gothian Templar Knights. Image from Volume 13, page 321 "The Penny Cyclopaedia of the Society for the Diffusion of Useful ...,"
Read More on the "Living Visigothic Nobility"